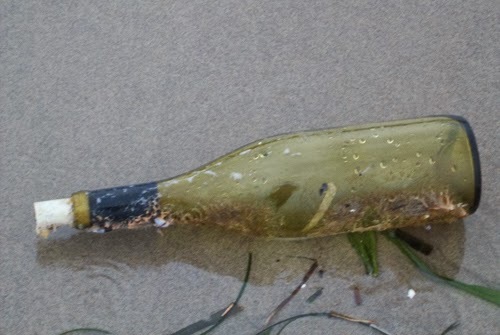 Storm tossed bottle washed ashore. This is my 260th post on this blog. I had hoped to post my 60th wave study but we are currently experiencing some very strong fall storms here on the wild Northern Oregon Coast and painting on the beach will have to wait. I am four weeks post-surgery as of tomorrow with another two weeks of restrictions yet to go. I have had more time than I have wanted to think, reflect, and plan. With the loss of my beautiful dog Twill and a somewhat drastically changed body, life has taken a bit of a bend in the road. For the past 25 years I have been outdoors at least once or twice a day (and often several times a day) every single day due to animals and pets. I thought when our beloved Twill crossed over, our last pet for now, I would have a complete day indoors more often. So far I haven't been indoors all day yet, I didn't even miss a day when I had surgery. I guess after 25 years being outdoors no matter what the weather has worn a deep groove in my neural pathways. I get terribly restless and irritable until I get outside. I usually burst out of doors with a huge sense of relief. The first of this month of September would have marked the end of my four years of art school had things gone as planned. I would have been deciding where to go from there. So many bends in the road these past five plus years.The past few months I have drifted off my preferred track, for several reasons that I won't go into here. With the deep thinking time I have had recently I have been realigning my path and getting back on my art track. I have been unhappy not being able to paint and draw much. My art school training was heavily based on drawing the figure and still life. All of which is excellent training no matter what genre and medium. With all the thinking I have been doing I have come to realize that I am happiest when I am able to paint outdoors, en plein air. It goes deep. I feel as if I have been made to paint outdoors. Of course, there will be plenty of studio paintings too and I still have a lot of work to do honing drawing and painting skills, studies that will be done in the studio. Take a train journey across Cananda with stops along the way to paint. Take a kayak expedition/tour of the Queen Charlotte Islands with my painting gear. Travel to England, Scotland, Wales and the Isle of Sark to paint. 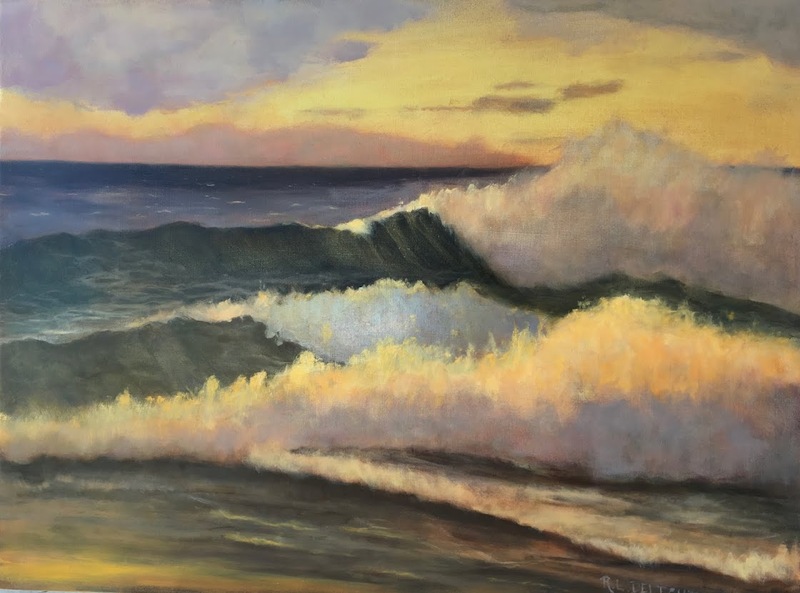 Take a seascape painting workshop with Don Demers. Take a train journey to the East Coast of the US to paint. Of course I could add a lot more! I have no idea at this time how I will accomplish this. All I know is I need to put my head down, work hard , and stay focused. I will be working on more paintings to sell as those are skills I need to build too. Well, I could go on but this is the kernel of all the thoughts I have been thinking about these past weeks. At the moment, we are having a sort of breather between storms. I say sort of because although the strong winds have died down for now, the rain is still coming down in torrents. I can hear the roar of the ocean waves from my spot on the couch here at home. I love it. I love the sea and the wildness. I love the beauty. Here is a short video I made today around 5pm when the storm abated. I am a mid-life painter. I love the outdoors and I get out everyday to walk, paint, and breathe. I live a creative life as an artist, gardener, musician, nature lover, environmentalist, builder, tinkerer, destroyer. I paint coastal landscapes and seascapes, with the occasional still life thrown in. I paint from life using my plein air studies and drawings. I live and paint on the Northern Oregon Coast with my loved ones. © 2012 R.L. Delight. Simple theme. Powered by Blogger.